If you ever feel bad about not getting certain things, keep this in mind. I didn't realize what her last name meant until, I don't know, middle school, where there's a shot of her license plate, and it clicked. I guess until then, I thought her name was like "Cadillac Deville" or "Bonneville" or "Chateau de Ville". Remind me to tell you sometime about me and self-addressed stamped envelopes. 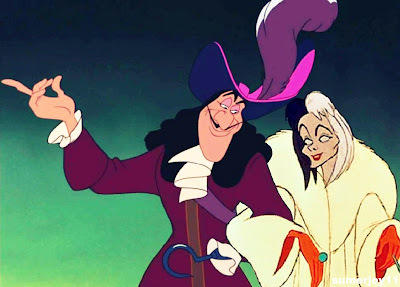 All that aside, I think pre-renaissance Disney considers this one of their best villains, and they've got a point. If you can kill cute little puppies, you've got to be pretty evil. (♪See my vest, see my vest...♪). 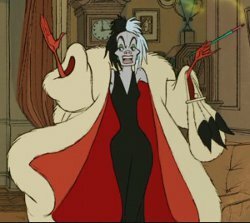 Motivation: Cruella is a fashionista. We just never know to what extent, given that we never see her empire, her clothes. All we really know is that she wants puppies so she can make a fur coat out of them. We're not sure if she's trying to start a new trend, or testing a prototype design, or for personal use. But the cruelty of her act outweighs her ambiguous motivation. 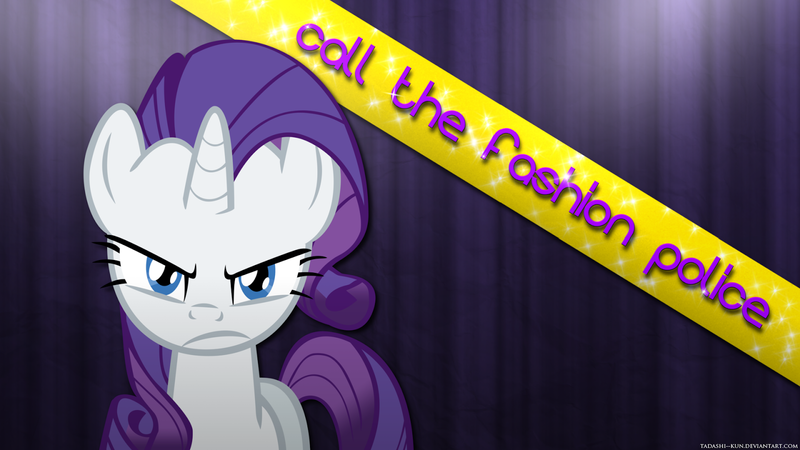 A little genocide in the name of fashion never hurt anyone. Character Strengths: Cruella can be quite persuasive. She must also have a sixth sense about her, because she barges into Anita's house, knowing that they're about to have puppies (she arrives 3 weeks early, and dalmatians gestate for 2 months). Both these traits probably help her avoid police suspicion given that A) they can't find any evidence against her and B) Anita decides not to charge her. I'm not sure if she made her money based on fur coats, or she has fur coats because she's rich. But it's damn bizarre to look at her and realize she's not that large, she's just wearing a big coat. Her body's as skinny as a twig. Also, she's got a catchy theme song. Evilness: Come on, do I really need to say it? Look, I'm not really a dog person. But Christ, man, how heartless can you possibly be to steal and kill someone's babies for something as mundane as a coat? And then the way she treats everyone as if they're beneath her is just icing on the cake. She's oblivious to the fact that she lives in a dusty old mansion and looks like Jack Skellington's grandma. 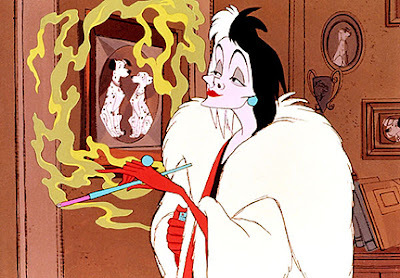 Tools: Cruella has little to no powers to speak of. Like Madame Medusa she exerts influence. But unlike her, she's got some money to back it up. 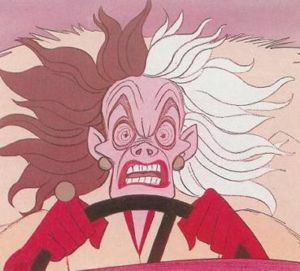 You never really see her using this in the movie, but it's implied by her mansion and 1932 Rolls-Royce. Complement to the Hero: There seems to be some kind of good vs. evil thing going on here. I can't quite put my finger on it. The main character has the last name "devil" and lives in "hell hall". Plus the black and white color motifs in her hair (and the movie at large). Her thieves have the last name "Badun". I guess it's too subtle for me. Fatal Flaw: Greed and a quick temper. As the movie goes on, you can see her sophistication and glamor shed away like so much pancake make-up into crazed avarice. I think near the end, she can't even remember why she wanted the puppies in the first place. Method of Defeat/Death: This might take the record for the least defeated villain. 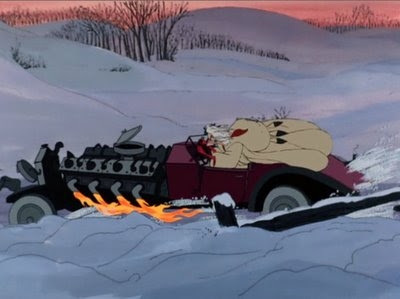 After Cruella and Horace & Jasper collide after attempting to drive the van with the puppies off the road, they careen down a mountain and land in the snow. As she watches her prizes drive away, she collapses in a fit of hysterics. And for the first time, Jasper gives her the classic "aw, shaddawp" retort. And... that's it? Then what happens? It's not like she died or got arrested (according to the canon) Does she find a different car and cut them off at the Radcliffe's house? Does she hire different henchman? Less idiotic ones? Does she just buy some Dalmatians and start a puppy breeding mill? Maybe I shouldn't think about this too much. It's making me sad. P.S. Wouldn't it be weird if the large house in the country they plan to buy for their "Dalmatian Plantation" turned out to be Hell Hall? Now that's a movie!